Jessica Saunders, MACPR, is the Senior Research Project Coordinator, Emergency Medicine at Nationwide Children’s Hospital. Protecting human subjects is a critical component to conducting clinical research. The U.S. Department of Health and Human Services requires human subject protection and Good Clinical Practice (GCP) training for clinical researchers.1 In addition, the Code of Federal Regulations (CFR) includes two regulations defining human subject protections (45 CFR Part 46 and 21 CFR Part 50).2,3 In the U.S., these regulations apply to all studies involving human subjects, whether experimental or descriptive. It is important for clinical research coordinators (CRCs) to receive human subject protection training as they are often the first points of contact for recruitment of potential research participants. 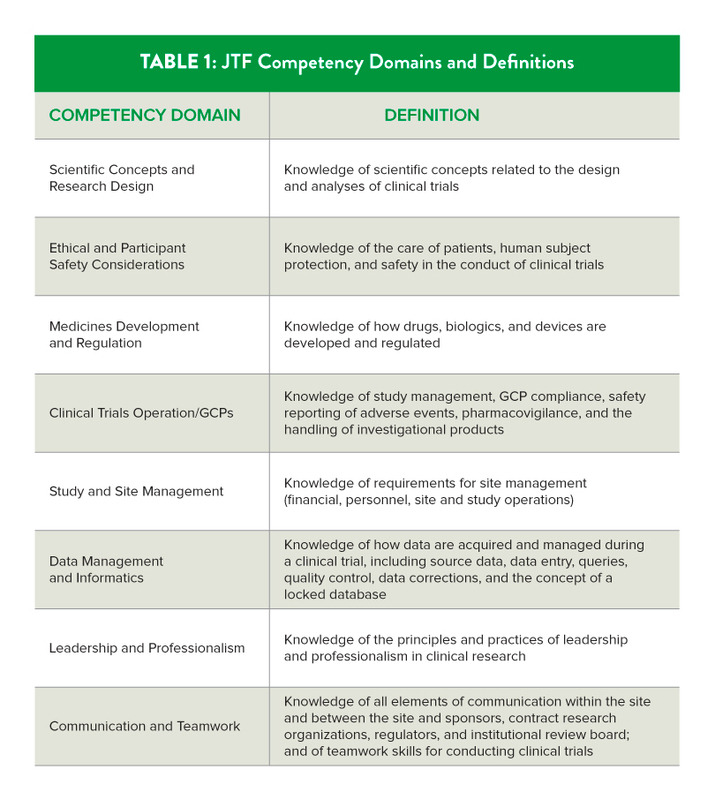 In 2013, the Joint Task Force (JTF) for Clinical Trial Competency developed eight competency domains for the purpose of creating a professional competency framework for the clinical research enterprise.4 These competencies are recognized by the Association of Clinical Research Professionals (ACRP) and many other groups nationally and internationally, and have been used as a guide in preparing professionals for achieving certification in clinical research. The eight competency domains are: (1) Scientific Concepts and Research Design, (2) Ethical and Participant Safety Considerations, (3) Medicines Development and Regulation, (4) Clinical Trial Operations (GCPs), (5) Study and Site Management, (6) Data Management and Informatics, (7) Leadership and Professionalism, and (8) Communication and Teamwork (see Table 1).5 These domains comprise 51 total competencies that cover important aspects of clinical research, and that have been accepted as a gold standard by ACRP for clinical research training and education. 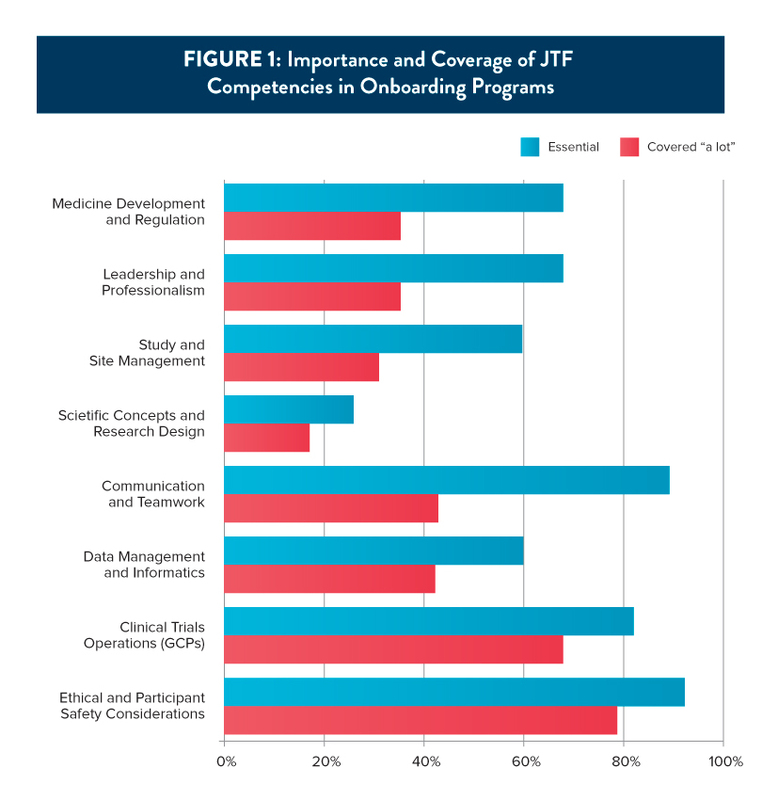 As the JTF Competency Domains (JTFCDs) are becoming more widely adopted, it is important to determine their use in onboarding training for clinical research staff. Despite the availability of the JTF competencies for professional development, it is unclear whether they are included in the training of clinical research personnel. 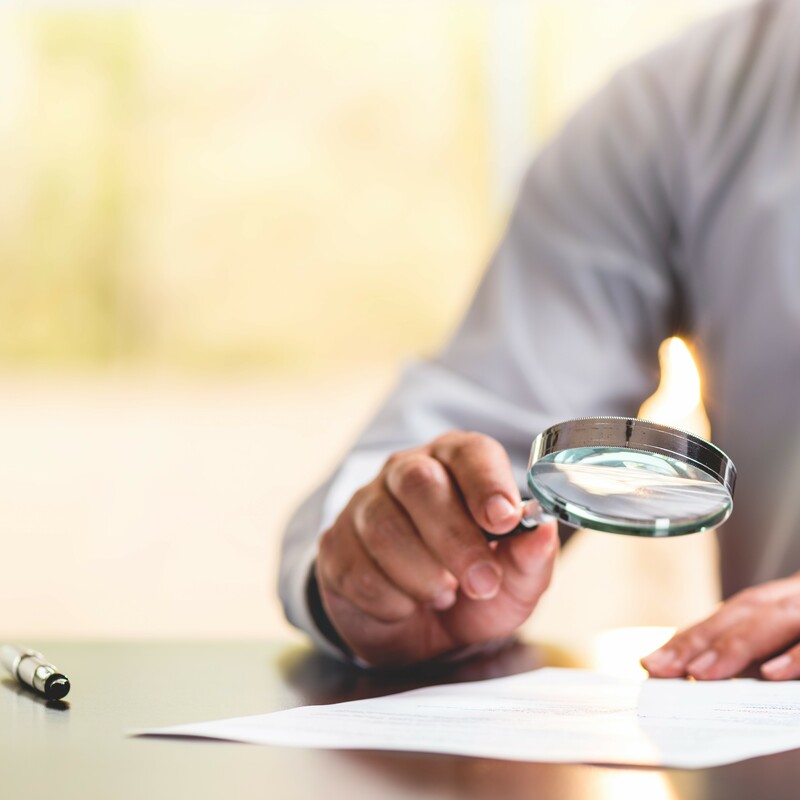 Knowledge of GCP and federal regulations can mitigate safety and efficacy breaches that can impact patient safety, study validity, institutional reputation, and legal status. However, there is a paucity of literature about methods for onboarding and inclusion of the JTF competencies in the onboarding process for CRCs and staff. The Pediatric Emergency Care Applied Research Network (PECARN) is comprised of 18 sites with a total of more than 80 CRCs. PECARN is the first federally funded pediatric emergency research network in the United States and conducts high-priority, multi-institutional research.6 PECARN sites represent academic, urban, and children’s hospitals. While study-specific training is conducted by investigators in the network for all studies, PECARN does not have a standardized onboarding program for CRCs. Each PECARN site is responsible for training or education for its own CRCs. Using the eight JTFCDs as a framework, the authors of this paper conducted a needs assessment survey within PECARN as a first step toward evaluating the need for creating a standardized, competency-based educational program to onboard CRCs within this multicenter research network. The following sections describe how the first objectives were to determine the existing inclusion of the JTFCDs at PECARN sites and to describe variations, enablers, and barriers to their inclusion at each site. In collaboration with their project managers, the authors designed a pilot survey instrument to distribute among clinical research staff from multiple sites to test for face validity. Reviewers did not participate in the final survey. Under 45 CFR 46.101, the Nationwide Children’s Hospital (NCH) Institutional Review Board exempted the study plan and survey tool. This anonymous, 19-item survey was distributed via e-mail to the site champions, who then disseminated a link to the survey instrument using Research Electronic Data Capture (REDCap) software. The survey was live for five weeks, and results were downloaded to STATA 13.0 for analyses. 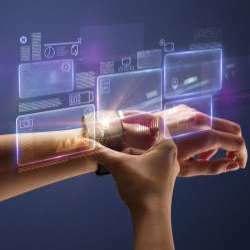 Data were analyzed using summary statistics. The survey was distributed to Emergency Medicine clinical research staff from 18 hospitals in PECARN during the summer of 2016. The questions covered demographics; site-specific training; knowledge of the eight competency domains; perceived importance of the domains; frequency of training on JTFCDs; and variations, enablers, and barriers with onboarding programs (see Appendix A, posted in the Site-Management & Coordination Interest Group on ACRP’s members-only Online Community). Using a Likert scale, participants were asked to rate the coverage of each JTF competency from “a lot” to “none,” and the significance of each competency from “not important” to “essential” (see Figure 1). Seventeen of the 18 PECARN sites participated in this survey, with a range of one to 10 CRCs responding per site. 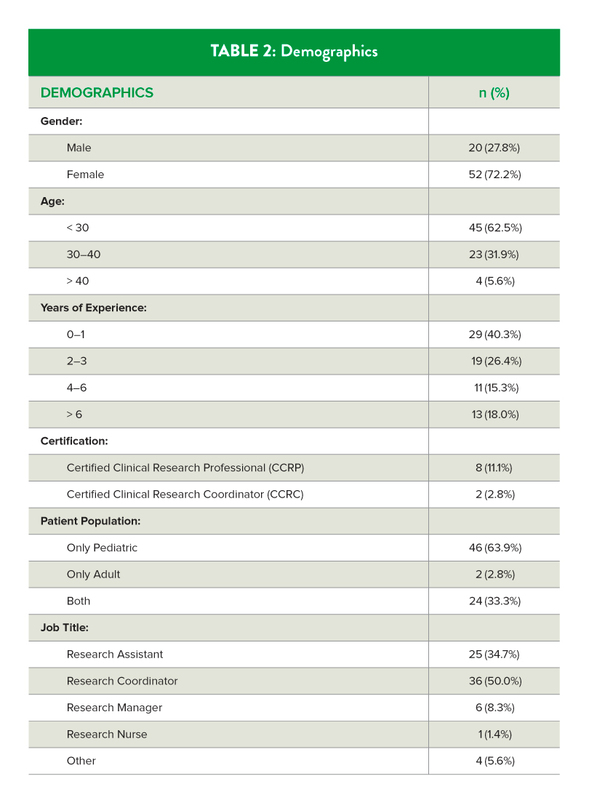 The overall response rate was 81% (72/89); of these, 40% (29/72) had a year or less of clinical research experience and 58% (42/72) were entry-level CRCs (see Table 2). 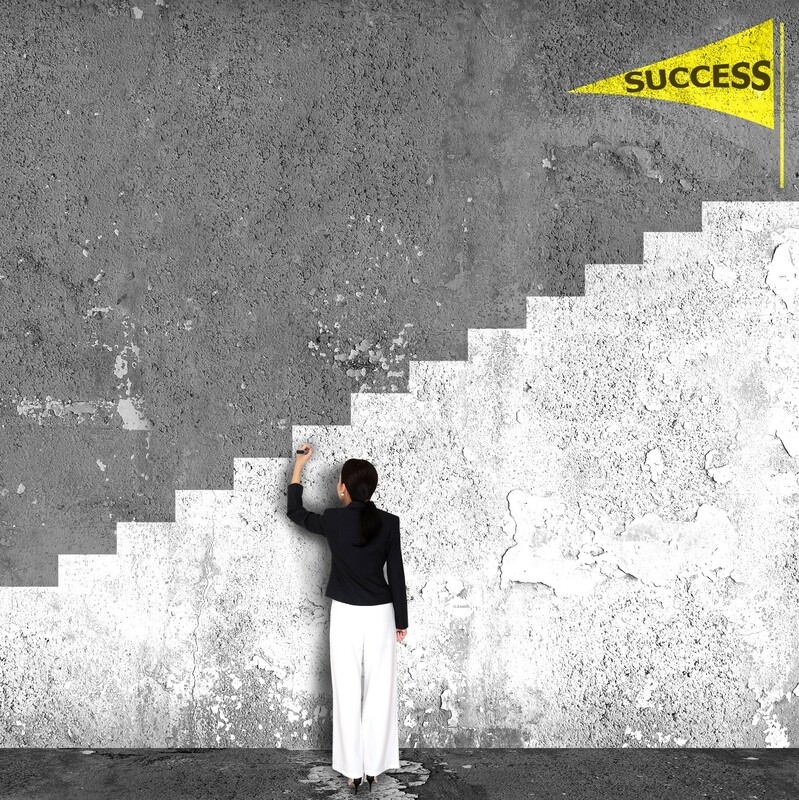 Of the individuals surveyed, 81% reported having an onboarding training program in their respective institutions. Most individuals (92%) reported that they completed online human subject courses or other web-based modules (89%), shadowing opportunities (86%), and peer mentoring (74%) (see Table 3). Respondents reported that the JTFCDs that were covered “a lot” (>50%) were “Ethical and Participant Safety Considerations” (57/72, 79%) and “Clinical Trial Operations (GCPs)” (49/72, 68%). Respondents rated “Ethical and Participant Safety Considerations” (66/72, 92%) as “most essential” and “Medicines Development and Regulation” (11/72, 15%) as “least essential” (see Figure 1). Most common barrier themes were lack of organization and lack of structure (see Tables 4 and 5). Overall, 32% (23/72) felt very competent to perform their job responsibilities after their onboarding training. Generally, all of the sites have some sort of onboarding training for CRCs. There is great variation between the 17 sites, but one common theme is that the majority of CRCs do not feel competent to perform their job responsibilities after their onboarding process. These data suggest that PECARN institutions’ onboarding programs do not include all of the JTFCDs and CRCs do not feel competent. Similar to the findings of this study, in 2008, a survey was distributed to 24 Clinical and Translational Science Awards (CTSA) centers to describe expectations and responsibilities of research coordinators and identify best practices for providing education, training, and support to CRCs.7 Only 20% of the institutions said they have implemented a CRC recruitment/onboarding program. All CTSA sites indicated that they provided training and 90% provide continuing education in a variety of formats, including preceptor/mentor training, web-based training, orientation courses, and conferences. However, the type, length, and frequency of training for onboarding varied greatly across each institution. Despite available training, only 45% of respondents from the CTSA centers felt that they received adequate training, identifying an unmet need in clinical research training. In addition, both studies found that a large percentage of CRCs did not feel adequate to complete their job after their training. From this international survey, less than 50% of the respondents were involved in the publication process or performing statistical analysis. In a different setting, results show their training only aligned with four of the JTFCDs (Data Management and Informatics, Ethical and Participant Safety Considerations, Scientific and Concepts and Research Design, and Communication and Teamwork), showing the gap is broader. However, the JTF competencies had not been published at the time of this study. These and our studies highlight variations in onboarding programs for CTSA sites and other research networks. These variations could occur in human subject protection and impact patient safety and study validity. Other programs, some of which are not research-based, such as the American Board of Pediatrics Physician competencies and the Quality and Safety Education for Nurses competencies, use competency-based structures to assess proficiencies.9,10 These programs suggest that CRCs would benefit from a competency-based program to measure proficiency. A 2015 JTF survey of more than 1,000 clinical research professionals assessed the current level of competence, significance to their role, and need for additional training amongst clinical research staff. Regarding the CRCs surveyed, the competency domains that needed more training (scoring >50%) were Medicine Development and Regulation, Study and Site Management, and Leadership and Professionalism.11 The survey supports the findings of our research that Medicine Development and Regulation is covered less than the other competency domains during onboarding. The CTSAs have recognized this issue, and were funded to implement a project titled “Enhancing Clinical Research Professionals’ Training and Qualifications” (ECRPTQ, 3UL1TR000433-08S1). Their goals were to “(1) develop and implement standardized GCP training and (2) develop and implement a competency-based education curriculum for study teams across the CTSA consortium that equips a highly qualified workforce with the necessary competencies to effectively, efficiently, and safely execute clinical trials.”12 A subsequent grant, “Development, Implementation, and Assessment of Novel Training in Domain-Based Competencies (DIAMOND)” (U01-TR002013), seeks to create opportunities for shared domain-based training across CTSA-hub sites through a federated platform using the ECRPTQ/JTF framework, and to develop and share assessments for that training. The next step for the JTF involves mapping the competencies to higher education curriculums in a manner defining competencies by levels of experience (fundamental, intermediate, and advanced), which will contribute to targeted training and shaping clinical research staff job descriptions. The JTFCDs are being utilized at the annual ACRP Meeting & Expo as a framework for training track breakout sessions.13 While there is a broad adoption of the JTFCD, our survey demonstrates that there are significant training gaps among current clinical research groups in academic medical centers. One limitation to this study is that the outcomes rely on self-report. In addition, although this was a multicenter survey, our results may not be generalizable because this was a convenience sample of 18 largely academic centers within a pediatric research network. However, most regions of the United States were represented, and our response rate was very high. In addition, we did not ask each respondent what the length of time for onboarding was at his or her institution; this is an area for future work. Most sites within the PECARN network have an onboarding process that includes several different formats to cover the JTFCDs. CRCs understand the importance of the JTF competencies. However, many CRCs feel less than competent to perform their jobs adequately, and this may have an impact on the quality of clinical research. A standardized competency-based institutional onboarding program may address this issue. PECARN is supported by the Health Resources and Services Administration (HRSA), Maternal and Child Health Bureau (MCHB), and Emergency Medical Services for Children (EMSC) through the following grants: DCC-University of Utah U03MC00008), GLEMSCRN-Nationwide Children’s Hospital (U03-MC00003), HOMERUN-Cincinnati Children’s Hospital Medical Center (U03-MC22684), PEMNEWS-Columbia University Medical Center (U03-MC00007), PRIME-University of California at Davis Medical Center (U03-MC00001), SW NODE-University of Arizona Health Sciences Center (U03MC28845), WBCARN-Children’s National Medical Center (U03-MC00006), and CHaMP-Medical College of Wisconsin (H3MC26201). MCHB/HRSA Contact: Diane Pilkey, RN, MPH (dpilkey@hrsa.gov). Speicher LA, Fromell G, Avery S, Brassil D, Carlson L, Stevens E, Toms M. 2012. The critical need for academic health centers to assess the training, support, and career development requirements of clinical research coordinators: recommendations from the Clinical and Translational Science Award Research Coordinator Taskforce. Clin Transl Sci 5(6):470–5. PMID:23253669. Eastwood GM, Roberts B, Williams G, Rickard CM. 2013. A worldwide investigation of critical care research coordinators’ self-reported role and professional development priorities: the winner survey. J Clin Nurs 22(5–6):838–47. PMID:23039162. Schaar GL, Titzer JL, Beckham R. 2015. Onboarding new adjunct clinical nursing faculty using a quality and safety education for nurses-based orientation model. J Nurs Educ 54(2):111–5. PMID:25602585. Sonstein S, Silva H, Jones C, Calvin-Naylor N, Halloran L, Yrivarren JL. 2016. Global self-assessment of competencies, role relevance, and training needs among clinical research professionals. Clin Res 30(6);38–45. 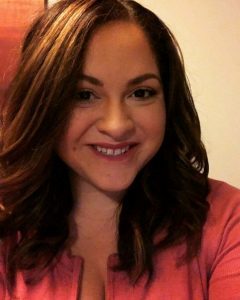 Jessica Saunders, MACPR, (jessica.saunders@nationwidechildrens.org), is the Senior Research Project Coordinator, Emergency Medicine at Nationwide Children’s Hospital. Kyle Pimenta, BA, BS, CCRP, is Senior Clinical Research Coordinator at University of California Davis Medical Center. Sally Jo Zuspan, RN, MSN, is Director of Research at the University of Utah. Robyn Berent, MS, MBS, is the Pediatric Emergency Medicine Research Manager at University of Oklahoma Health Sciences Center. Noelle Herzog, BS, is Clinical Research Coordinator at University of Michigan Health System. Carolynn Jones, DNP, MSPH, RN, is Associate Professor of Clinical Nursing at The Ohio State University. Jennifer Kline, MPH, CCRP, is a Senior Research Associate at Nationwide Children’s Hospital. Kendra Kocher, CCRP, is Research Project Manager at Children’s Hospital Colorado. Venita Robinson, MHSA, CCRP, is Clinical Research Coordinator at Cincinnati Children’s Hospital. Bobbe Thomas, BA, CCRP, is Clinical Research Program Manager at Children’s National Health System. Rachel Stanley, MD, MHSA, senior author, is the Division Chief, Emergency Medicine at Nationwide Children’s Hospital.